The Low-Down: How Many Robots Does It Take To Fill A Grocery Order? Ocado Group put together an order of 50 items, including produce, meat and dairy, in five minutes. Fulfilling a similar order at the company’s older facilities takes two hours. The secret: a fleet of 1,000 robots. The new facility will be just as productive as an earlier, larger warehouse that needs three times as many employees. It threw out less than 1% of its inventory, compared with 5% for the retail and manufacturing sector. The software also can predict demand, so products ship while fresh. The U.K.'s biggest online grocer hit a milestone this year: Ocado Group Plc put together an order of 50 items, including produce, meat and dairy, in five minutes. Fulfilling a similar order at one of the company’s older facilities takes an average of about two hours. The secret: a fleet of 1,000 robots that scurry about a warehouse snatching up products and delivering them to human packers. The breakthrough and ones like it could help propel the grocery business into the modern era. The industry wants to make buying food online as simple and commonplace as purchasing clothes or consumer electronics. But fulfilling fresh food orders quickly, reliably and profitably is devilishly hard. Even Amazon.com Inc., which recently acquired Whole Foods Market, hasn’t cracked the code and recently halted its Amazon Fresh service in several U.S. states. Ocado, founded 17 years ago in the London exurb of Hatfield, says automation is the only way to handle individualized grocery orders in large volumes. The robots are the latest addition to Ocado's automation arsenal; the company also sells software and hardware to other retailers. So far, Ocado has no firm bites for its robots, but Chief Technology Officer Paul Clarke says the Amazon-Whole Foods deal "definitely increased the sense of urgency in the discussions with prospective customers. It's underscored for them that this world is changing and that they need to move online as quickly as they can. They're interested in having some of that business without taking 17 years to innovate themselves." For grocers unwilling or unable to invest in robots, Ocado offers software that helps them set up an in-store picking system—like the one Wal-Mart uses—with the hope that they'll eventually buy the whole package. Today, most grocers fulfill online food orders manually—a labor-intensive endeavor. "Having somebody walking through aisles in a warehouse picking up things one at a time in a cart, it's suboptimal," says Dan Kara, research director of robotics at ABI Research. Ocado embraced automation from the beginning. Founded by three former Goldman Sachs merchant bankers, the company first relied on a kind of trolley that moved among the shelves, making stops for employees to hop off and grab the items they needed. Its engineers were concurrently building automation technology; within a couple of years, Ocado moved to a conveyor-based system and has continued to improve its software and add more machines, such as cranes that move bins of food onto shelves. 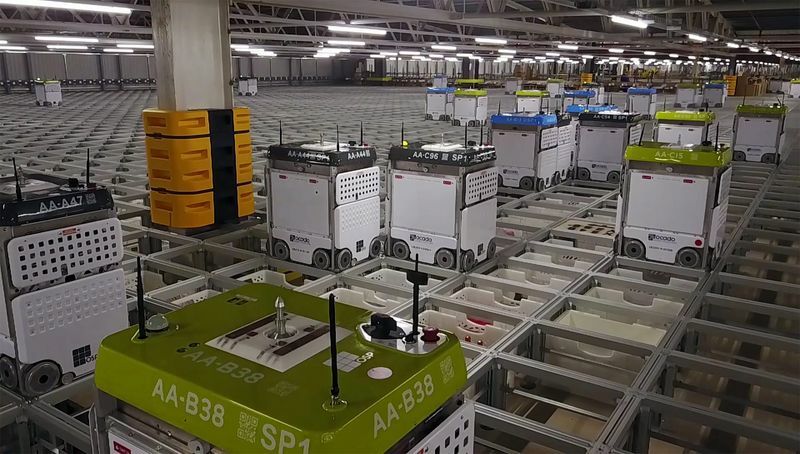 Ocado's state-of-the-art facility opened about a year ago and has automated the most labor-intensive part of fulfillment: fetching items, a task known as picking. About 200 people also work there handling tasks machines currently can’t, including loading and unloading trucks. Once at full capacity, the new facility will be just as productive as an earlier, larger warehouse that needs three times as many employees. The fulfillment center is divided into sections by temperature: ambient, chilled and frozen. 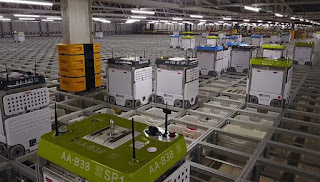 The first two have a similar setup: squat, rectangular robots, developed with manufacturer Tharsus, sit atop a rectangular grid, with layers and layers of crates beneath holding the 50,000-plus products Ocado sells. The robots move at 4 meters a second (about 9 miles an hour), controlled by software that knows what items are needed at any given time. Automation means Ocado can sell a larger variety of products, from meal-kits to high-end frozen food. It also helped the company cut waste; last year, Ocado says it threw out less than 1 percent of its inventory, compared with an average of less than 5 percent for the U.K. food retail and manufacturing sector. The software also can predict demand, so Ocado can bring in products and immediately ship them out while they're fresh. After years of reporting losses thanks to heavy investments in automation, Ocado became profitable in 2014. The stock peaked the same year but has since fallen more than 50 percent to 284 pounds ($371), partly owing to rising competition from the likes of Amazon and Ocado’s struggle to sell its technology beyond a few customers. Despite the robots and smart software, Ocado still relies on thousands of people to pack boxes, load trucks and then deliver the food. While this provides jobs, having a thousand-plus people focused on rote tasks comes with its own issues. In the warehousing industry, packers sometimes burn out and look for better-paying work. They make mistakes, putting items in the wrong boxes. And they get hurt doing hard manual labor. Ocado is already looking to automate other parts of the fulfillment process. It’s experimenting with autonomous vehicles to make curbside drop-offs. Drones are another possibility. Replacing human packers will be much harder because that requires a robot that can duplicate the dexterity of the human hand, the ability to grab a bunch of kale, say, without damaging it. A Silicon Valley startup called Grabit has one possible solution: a robot that uses static electricity to manipulate objects. Nike is testing the machines to assemble shoes, but at $100,000 apiece, the robots are still too pricey for the grocery industry. Ocado is working with a group of universities to test a robot arm that can pick fruits and vegetables without bruising or injuring them (see video above). The march to automating online groceries has begun, and analysts say there's no stopping it. In time, Kara says, robots are "going to be much more functional and much cheaper, and they will become ubiquitous."